Recently the subject of helium shortage and the possible use of hydrogen or nitrogen as alternative carrier gases in GC-MS became a hot topic in various forums, blogs and GC-MS vendor seminars. We published our opinion on this topic in another post called "Helium Shortage and Hydrogen as a Carrier Gas for GC-MS" a few months ago. In short, we believe that the helium shortage problem is not a long lasting one as alternative natural gas wells are being found and they are likely to contain helium due to long time radioactivity in deep gas wells, albeit the helium price might increase. Due to the advantages of using Helium our advice is to continue and use it as the carrier gas for GC-MS while purchasing additional cylinders "just in case" a temporal shortage will occur. If and when the helium supply is disrupted, hydrogen or nitrogen can serve as natural alternative carrier gases, but they do come with their own set of problems. Hydrogen is a reactive gas and it degrades certain compounds without a simple indication to what these compounds could be. Note that this hydrogen related reactivity is mostly indirect, via the promotion of surface activity at the liner, column and standard EI ion source metallic surfaces. For further explanations please read the above linked blog post. Hydrogen also somewhat reduces the sensitivity. While nitrogen is inert, its main downside is that it significantly reduces the GC-MS sensitivity. This post presents a viable approach to avoid the Helium shortage problems through using the 5975-SMB GC-MS with Cold EI while eliminating any sample degradation issue and providing similar or almost similar sensitivity as with helium. Keep reading to find out how the 5975-SMB GC-MS with Cold EI enables helium-free unperturbed operation with nitrogen as its column carrier gas and hydrogen as the Cold EI make up gas. Clearly Helium is the ideal gas for the operation of standard GC-MS and similarly GC-MS with Cold EI. Helium is perfectly inert, enables faster GC separation (compared with N2) and provides the best sensitivity due to its minimal ionization cross section hence lowest intra-ion source space charge. However, the main question addressed in this blog post is what is/are the optimal gases for the operation of GC-MS with Cold EI in case of helium shortage. The Aviv Analytical 5975-SMB GC-MS with Cold EI is operated with helium as the column carrier gas at any flow rate, up to 60 ml/min and helium make up gas that is added in front of the supersonic nozzle to combine with the column carrier gas for a typical total (column + plus make up) gas flow rate of 65 ml/min. GC-MS with Cold EI requires a light carrier gas for both effective jet separation and sample acceleration for the filtration of vacuum background. However, while hydrogen can be used instead of helium for the analysis of hydrocarbons, its reactivity precludes its use for most other types of analysis and thus, for most analysis, nitrogen must be used as the column carrier gas. We tested the operation of the 5975-SMB with nitrogen with 1 ml/min column flow rate and 4 ml/min make up gas. Since nitrogen is heavier than Helium, 5 ml/min nozzle flow rate was sufficient for obtaining good vibrational cooling and Cold EI mass spectra. However, the sensitivity and signal dropped by a factor of 30 which meant that while nitrogen could be used for Cold EI for many applications the signal loss was undesirable and/or unacceptable. Thus, the best idea that we conceived was to use nitrogen as the column carrier gas and hydrogen as the supersonic nozzle make up gas. Consequently, a nitrogen gas line was connected as usual to the GC instead of helium while a hydrogen gas line was separately connected to the Aviv Analytical make up gas supply that has its own electronic flow controller (Alicat). From pure gas dynamic consideration we note that 8% N2 in H2 has the same average mass 4.0 of helium. Furthermore, being diatomic molecules, and with higher polarisability than helium, the cooling efficiency of such gas mixture is expected to be much better than of helium thus less N2/H2 gas mixture flow rate is needed for effective cooling in Cold EI. After a few experiments and ion source tuning optimization with PFTBA we converged on the addition of 15 ml/min hydrogen to 1 ml/min nitrogen column flow rate. Cold EI ion source tuning with this gas mixture was simple and in comparison with helium it required more negative focus Lens 2 voltage (-30V) and more importantly the nozzle-skimmer distance had to be increased from 7 mm to about 11-12 mm. We found that hydrogen induced emission current reduction, and at our standard filament operation power (what we normally use with helium) it resulted in x4 lower emission current. This effect is likely due to hydrogen related increase in the tungsten filament work function (Nitrogen itself did not affect the emission). Thus, in order to maintain the same emission current at the same filament heating power we moved the transfer line back from the skimmer by about 4-5 mm and observed that when the ionization gauge reading was 8x10-6 mBar as with helium operation (Agilent performance Turbo with 250 L/S pumping speed) the emission current was similar and practically little or unaffected by the hydrogen make up gas. Consequently, we performed a comparative analysis of our test mixture with He versus N2/H2 using the experimental conditions as below. Gases: Helium in a cylinder at 99.999% purity, Nitrogen in a cylinder at 99.999% purity and Hydrogen from a Domnick Hunter hydrogen gas generator with external water vapor trap. Sample: Aviv Analytical standard test mixture of 10 ppm each Hexadecane (n-C16H34), Methylstearate, Cholesterol and n-C32H66 in hexane. The sample was originally purchased from Restek at 1000 ppm and diluted to 10 ppm by Aviv Analytical. Column flow rate: 5 ml/min He in the Helium carrier gas experiments and 1 ml/min N2 in the Nitrogen carrier gas experiments. On column amount: 2 ng each of the sample compounds as above. GC Oven: 50ºC followed by 30ºC/min to 300C and wait 2 min for total of 10.33 min. Cold EI source: 12 mA emission current. SMB transferline temperature: 250ºC with temperature program of 10ºC/min after 5 min to 270ºC. MS parameters: Mass spectral scan range was 50-500 amu and scan speed ~3.2 Hz. Our advice is to stay with helium and purchase an additional spare helium gas cylinder if you suspect that its supply could suffer from short-time shortage periods. However, if helium shortage will occur, this note describes a viable solution for continued GC-MS with Cold EI operation via the use of nitrogen as the column carrier gas and hydrogen at 15 ml/min as the nozzle make up gas. The use of nitrogen as column carrier gas is not as flexible as helium and it does not permit the use of high column flow rate or flow programming without signal loss. 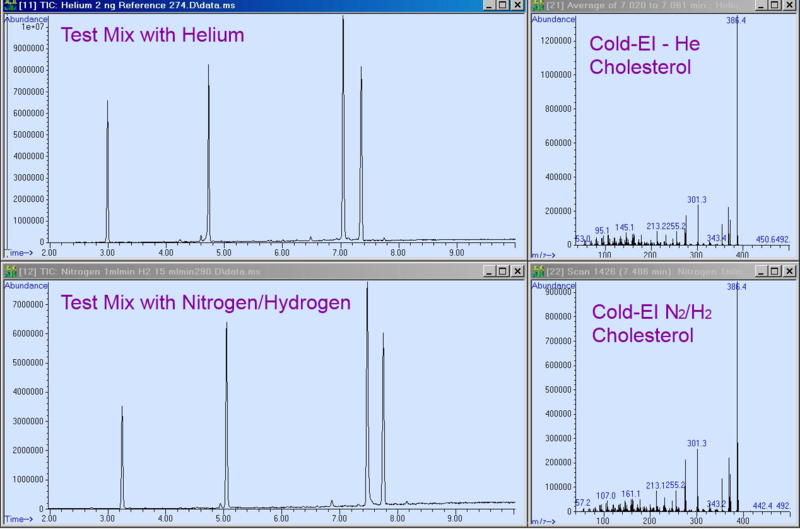 Nitrogen is also a little less effective than Helium in gas chromatography at a given temperature programming rate, and in view of its lower column flow rate is less effective in the analysis of labile compounds, BUT, it provides an inert alternative to helium and permits the continued operation of GC-MS with Cold EI under helium shortage conditions. The addition of 15 ml/min hydrogen requires some safety precautions as always with hydrogen, but 15 ml/min is a low flow rate (half of what is used in GC-FID for the FID), and it requires the output of the rotary pump to be properly vented into a hood or outside the building according to local practice and rules. Similarly the use of hydrogen gas generator is to be preferred over gas cylinder. Accordingly, the 5975-SMB GC-MS with Cold EI can be effectively operated with nitrogen as column carrier gas and hydrogen as nozzle make up gas, with minimal changes to the analysis method and with little signal loss while having about the same noise level.